This month we’ll look at the installation of the radiator and related components in the engine compartment. The E-Type has a reputation for overheating. Whether this reputation is deserved or not is the subject of much discussion amongst enthusiasts. Without personally adding to the great debate, I think it is safe to say that the wise man will make sure that the cooling system on his E-Type is in outstanding condition. In my case, an inspection of my original radiator did not inspire confidence. So I decided to obtain a new one for my project. This coupled with a thorough cleaning of the coolant passages in the engine and installation of a re-furbished waterpump should put the car in good shape. And, as we will discuss, I upgraded the cooling fan. First the radiator. The original radiators were constructed from brass. Brass and its first cousin copper are venerable materials for radiator construction. New concours correct radiators can be purchased but they are not cheap. Aluminum has come into vogue with modern cars as a radiator material. Each material has its pros and cons. I decided to go with an aluminum radiator. 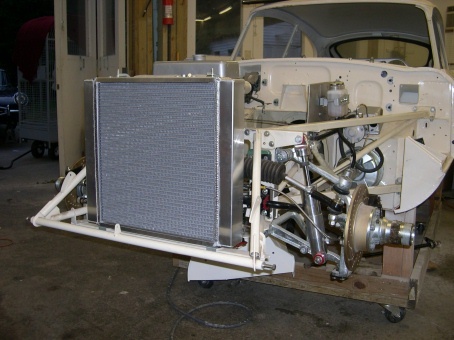 Ray Livingston has a “how too” article posted on the JCNA Technical Library site at http://www.jcna.com/library/tech/tech0020.html which discusses how to adapt a commonly available and thus inexpensive Howe radiator to the E-Type. Some fabrication and adaptation is required. I choose another route, which was to purchase an aftermarket aluminum radiator that has already modified. This unit was purchased from CoolCat Express (http://www.coolcatcorp.com). As we will see, this unit fit directly into position with no issues. Several other smaller pieces are needed to attach the radiator to the engine frame. 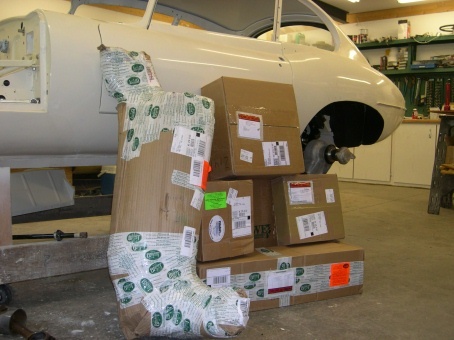 You can refer to the Jaguar parts catalog to obtain most details. Most of the usual vendors catalogs also show the necessary pieces in exploded views. In this case, I turned to a new vendor that I had not used before. That would be John Farrell. John, like many Jaguar parts suppliers, started as an enthusiast that was frustrated at the lack of parts support for the cars. John had the skills to fabricated parts on his own and has developed a small business from that starting point. John is a little old fashioned and (gasp) does not have an e-commerce website. Instead you send a self-addressed stamped envelope to John Farrell Jaguar Parts, 57D Alder Street, West Babylon, NY 11704 and he will send you a wonderful little catalog of specialty Jaguar parts, many of which are impossible to obtain from any other sources. John is also very approachable on the phone, as long as you are able to translate his “Brooklynese” into your local dialect. By all accounts, John is one of the “good guys” and a pleasure to deal with. From him I bought 2 odd shaped brackets that sweep back from the top of the radiator to the mounting bracket for the overflow tank and 2 brackets that the radiator sits on. I also purchased a fiberglass radiator fan shroud from John. Both came pre-painted in the correct colors and fit perfectly. I also purchased various rubber grommets and hardware from Terrys. Another item I decided to purchase from CoolCat was their electric radiator fan unit. This unit has received a strong thumbs up from the Jag-Lovers forum community. It certainly looks to be much more effective that the pathetic propeller that came originally with the car. Finally, I had to deal with the expansion tank. If you look most modern cars have a plastic tank mounted off to the side of engine compartment where radiator fluid can be added. When the engine heats up to operating temperature, the net volume of the radiator fluid expands a small amount. The extra volume has to go somewhere and the expansion tank provides the necessary space, ergo the term “expansion tank”. 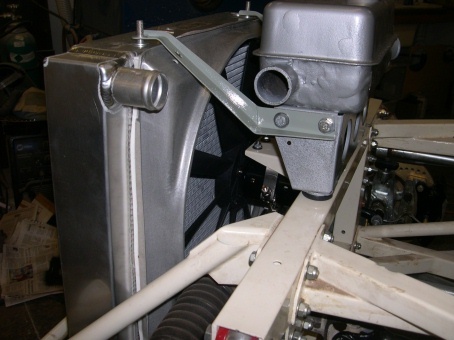 On the E-Type, the expansion tank is fabricated out of metal and is mounted directly behind and slightly above the radiator. As is my usual fashion, I took my expansion tank to the bead blast cabinet and remove the existing finish in preparation for painting. I was dismayed to see small corrosion pinholes in the tank. I was tired of spending money at that moment and decided to try an experiment. I patched the holes with 2 part epoxy putty that is supplied by POR-15. After the epoxy had set up, I painted the tank with its correct color. We will see if the repair holds. If not, it is very accessible for quick replacement if required. Once all the various parts and pieces were available, final assembly was fairly straightforward. Remember to install the fan first before installing the radiator. The resulting change to the front profile is very dramatic. Just looking, it is not clear how the hood will fit over the radiator but I am sure it will. Next month we will look at fabrication and installation of the electrical wiring.